Saturday May 26th 1900 I did baking and got the dinner. In the afternoon I dressed a turkey and swept the house up. I was hard at work all day and it was very warm. Mort went home this morning with a sprained foot. Leonard went to town at night. Sunday May 27th 1900 The folks were down from home. They brought Lorie Faltz with them. [Ossie] and the children John & Callie with the two little girls and Eds folks were here to spend the day. John & Callie went up town soon after dinner to attend the funeral of Mrs Dove Simpson The day was warm but I got along with the dinner nicely and we had a very pleasant visit. 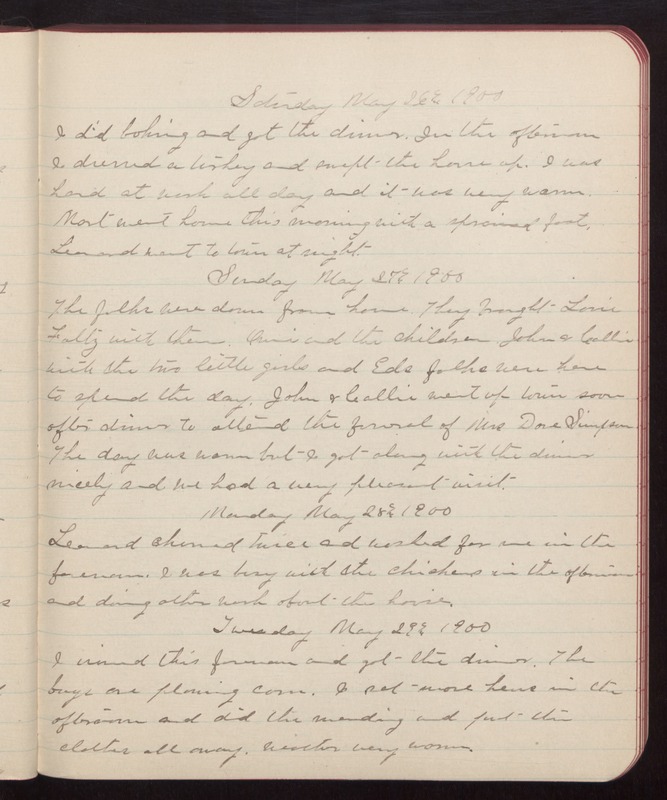 Monday May 28th 1900 Leonard churned twice and washed for me in the forenoon. I was busy with the chickens in the afternoon and doing other work about the house. Tuesday May 29th 1900 I ironed this forenoon and got the dinner. The boys are plowing corn. I set more hens in the afternoon and did the mending and put the clothes all away. Weather very warm.